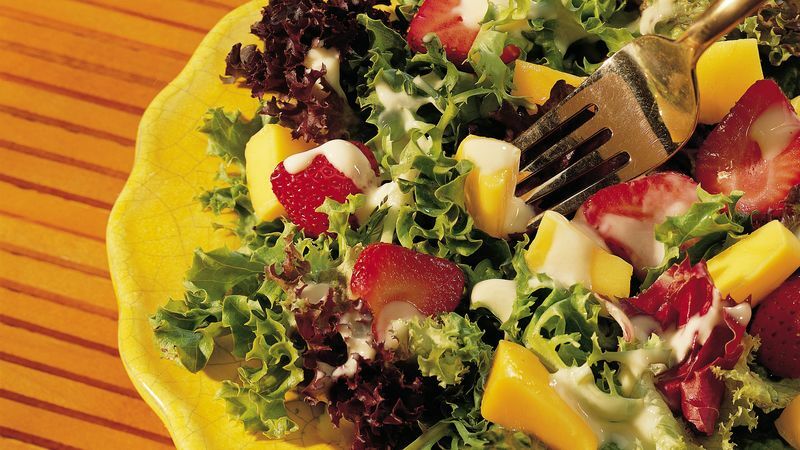 Mix all Orange-Yogurt Dressing ingredients. In large serving bowl, toss all Salad ingredients; serve with dressing. Need help cutting a mango? Score the skin lengthwise into fourths with a knife, and peel like a banana. Cut the peeled mango lengthwise close to both sides of the seed, then cut into pieces. Choose dark-green greens for your salad. Romaine and spinach top the charts nutritionally. In general, the darker the green, the more nutrients it has to offer. Use one large peach or nectarine for the mango.